Hartman's, a lost institution. Incredible steaks, and those fried banana peppers and pickles! Who could forget the miles of business cards that lined the lobby? The decor was 1950's steakhouse, simple, warm, homey. 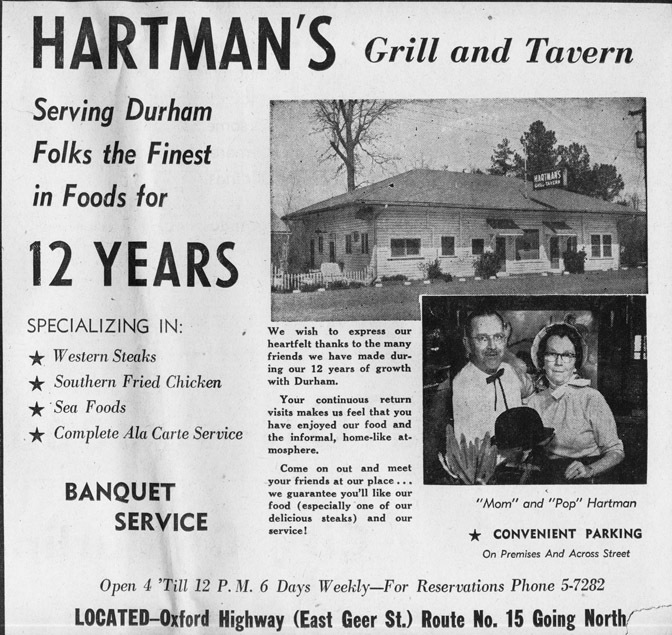 I still think about the wonderful meals I had there, and often think "Hartman's would be good tonight!" I agree, Hartman's looms large in the collective memories of many who grew up in Durham. It was always a "special date" to go to Hartman's. And, yes, the fried banana peppers were fantastic! Thanks for a great memory, Gary, and I'm sorry to hear it closed. Never enjoyed eating out at any place more than Hartman's. The cozy atmosphere, especially near the fireplace, was very soothing. And the steaks were great. I really miss it. I still get a taste for Hartman's Salad. I have never found any place that can duplicate the recipe and taste of their house salad. I never ate them but my dad loved fried frog legs from Hartmans. Never had the pleasure of eating their. I'm sure it was delicious. I think Dilliards and The Chicken Hut in Southside Durham are still open. Keep up the good work my friend. Wow....this brings back memories of a high school date or two with these two posts back to back. Dinner at Hartman's before a movie at the Starlite. The big "gourmet" restaurants in the late '60's were the Angus Barn and Hartman's. My whole family went to Hartman's to celebrate my graduation from Duke in 1969. Also had a couple of special dates there as well. Sorry to hear it closed, but a 60 year run (not 50, sorry Gary) is damned good. Great memories and thanks for the post. Loved their blue cheese salad and fried banana peppers! Our family was huge, so we'd often get the private room for dinner. I last ate there in the early 90s, but I heard they switched owners and really went downhill several years before they closed. Thanks for catching my poor basic math execution, anon - fixed. Nice old pics of Hartman's. It has not been sitting empty. It was sold/leased to someone who operated it for a short time as 'The Ark' I believe. Maybe something similar to that name? We stopped by for dinner to try it out and were a bit disgruntled to learn that they no longer had permits to serve adult beverages. After complaining a bit, a fellow group of diners informed us that the new manager/owner was a female pastor in an A.M.E. church in the area. I never verified that. No need to do so, the food was not what it had been as Hartman's. We used to live in Milan Woods - about a mile from Hartman's. When we bought the house (our first), part of the closing was that we got a gift certificate for a free dinner at Hartman's. I remember enjoying it though I don't remember any of the details of the restaurant. We lived in Milan Woods for almost a decade, and we regularly drove by the Starlite, Glenn School, Oak Grove, etc. Most people didn't (and still don't) know much about that part of Durham. Thank you for your posts! It's hard to find a restaurant with that kind of service, atmosphere and good food in any town now. Ah - Hartmans. It was always a place for a celebration or a "special date". My parents took us there for special occasions when I was a kid and teenager in the 1970s, and I proposed to my college girlfiend there in 1981. The steaks were great too. My family used to go to Hartman's for birthday and anniversary celebrations. My grandfather and I would always split an order of the fried banana peppers. My friends and I even went there for our Junior Prom in 1992. Lots of great memories there! I remember the pond in the back with the beautiful swan. 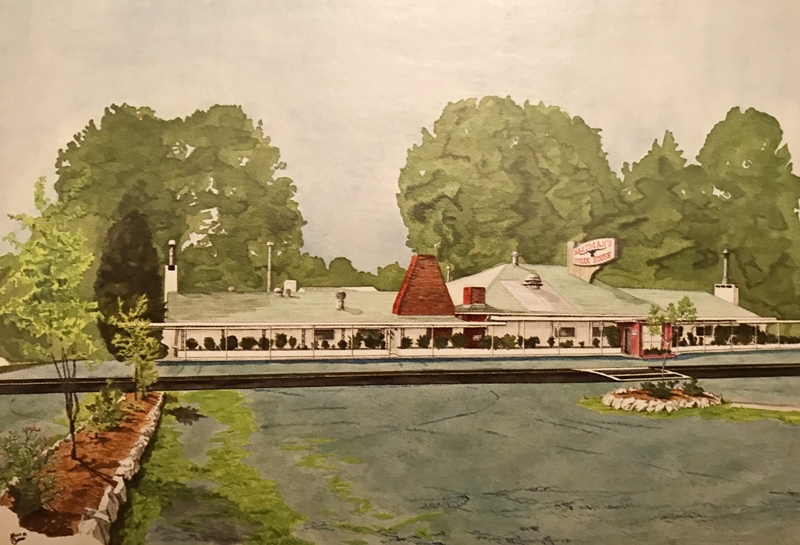 Never ate there, but as a kid I would look at the pond as we drove home from working on my uncle's farm on Dearborn Drive. My husband and I both have fond memories of eating at Hartmans. He remembers going to the original white building with his parents as a boy. We really misses the blue cheese salad so after many attempts, my husband has been able to create one that is just like it. Yum. 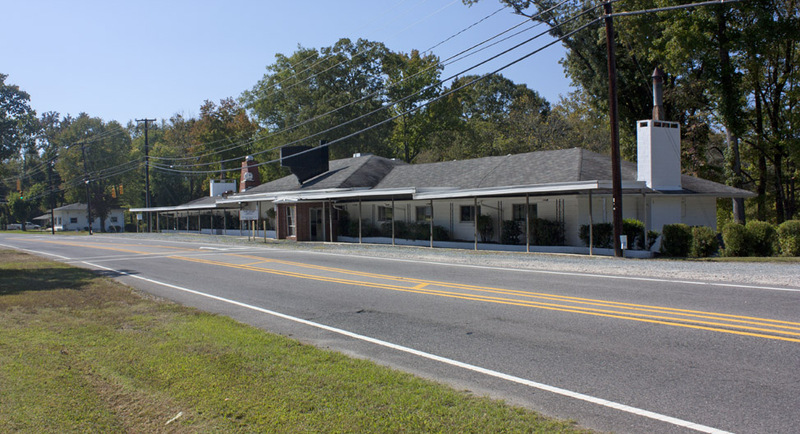 I would love to hear more about Oak Grove - especially a little country store that used to sit on the corner of Wake Forest Hwy and Patterson Road. There was an old farm house on the left of Wake Forest Hwy right before you got to the store and intersection (Sherron Road was to the right) and I lived there when I was a little girl. Think it was called Husketh's Place but not sure. I remember hartmans too when a young kid in the 60s for christmas. although known for its steaks, i probably had a steak burger. yes, some of the visual highlights were the business cards stapled to every square inch of pine panneling,the big bulb/multi colored christmas lights, the large panneled windows looking out to the pond flanked with ducks, geese. she was an institution. they don't make them like that anymore. The plaster cows out front! (out back?) We'd come over for dinner from UNC in the early 1970s. Loved the steaks! This was an exceptionally nice place for many years. I actually think that it opened in 1940, rather than 1941. I base this on the fact that their old phonebook ads read "Since 1940." Anyway, I remember going there two or three times while growing up and I agree with the one writer that the blue cheese salad was very good and unusual for the time in that they actually mixed the dressing in the salad rather than pouring over the top. I also remember a large pond out back that was visible from the dining room with an abundence of waterfowl in and around it. Oh Jane. Any way I could get your husband's recipe. 4 years at Duke and another 25 years in the 80's and 90's: I still taste the Hartman's salad but I have not quite gotten the dressing right yet. They also had the best seafood cook in town--maybe in the south.I(f ypu emailed it to sagrelto@sagrelto.info I would get it. Thanks and happy memories. Hi Jane. I have lived in Oak Grove all my life. it is now only a sad resemblance of the community that it once was. Though lots of the same people live in the area, most all the farms, fields, people sitting on front porches are a thing of the past. The intersection that nice had the little country store now holds a strip of businesses that include a store, Mexican restaurant, grill, used car lot & auto repair shop. The other corners include a CVS, Advance Auto, Foodlion, She'll Station, and an upcoming Walgreens all surrounded by overcrowded subdivisions. I have memories of that old store as a little girl. It was a rare treat to go there to get a hotdog & hand dipped ice realm cone. They were the best!!!!! I would love to have your bleu cheese dressing recipe. I miss Hartmans and all the other little local businesses and the feeling of a close knit community. Do you happen to have the recipe for Hartman's Blue Cheese Dressing? My first job was as a hostess at Hartman's. Everyone wanted the romantic downstairs room by the big picture windows that overlooked the pond. The line on Friday and Saturday night went forever down the sidewalk out front. Boy do I miss those banana peppers. I loved them so much as a child that I would receive two large orders of my very own , instead of a birthday cake each year. WOW the nostalgia and memories this brings back. For those who have been asking about the recipe for Hartman's Stake House blue cheese dressing, my mother was friends with the owners and often arranged company dinners there. The owners were kind enough to share the recipe with her. It is as follows: 1 cup mayonnaise, 1/2 cup buttermilk, 1/2 tsp onion salt, 1/2 tsp garlic salt, 1/2 tsp lemon juice, 1/2 tsp worcestershire sauce, 1/2 tsp vinegar, 6 ozs Kraft blue cheese. 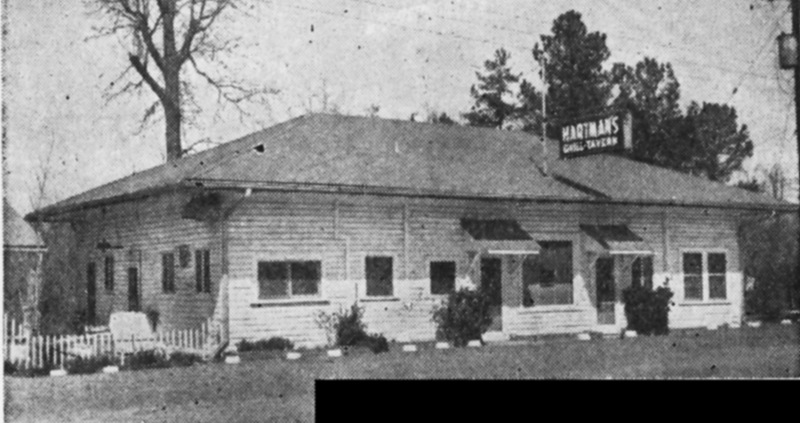 I never ate at Hartman's Steak House, but it came across my radar when I was researching Durham's oldest continuously operating restaurant for my post about Bullock's - I thought perhaps it was the winner, having opened in 1940 (three years before Bullock's) but soon realized that it closed in 2001, at its 60 year mark. Efforts to revive the location with other restaurant concepts in the 2000s failed to find the same audience Hartman's had long enjoyed, and quickly closed. Local non-profit TROSA acquired the property in 2011. This building was the subject of a What's It Wednesday?! post on Open Durham's social media accounts (Facebook and Instagram), the week of January 2, 2019. Follow us and stay tuned for more finds! The plaster cows out front!